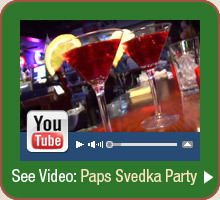 Pap's is a wonderful neighborhood bar with a comfortable welcoming attitude. We've been in business over 20 years and we're known for our awesome food and great drink specials. We take pride in offering a full selection of domestic, craft and imported beers — with a dozen drafts and many more ice cold from the cooler. Come on in try our award winning pizza, tantalizing chicken wings, and customer favorites: our half-pound Black Angus burgers. Enjoy our other selections like ribs, gyros, chicken, steaks, seafood, pasta, Italian beef and wraps.